In the emotion charged atmosphere of Sridevi’s unexpected death last week, one more death happened quietly, without as such fanfare as hers. Of course, the man who died was not an actor, or politician or public icon in the sense Sri was, but in his own way, he did create a bit of drama and excitement - enough to rock a spiritual establishment ,which traces its way back to Adi Shankaracharya , the reviver and resuscitator of Hinduism centuries ago. 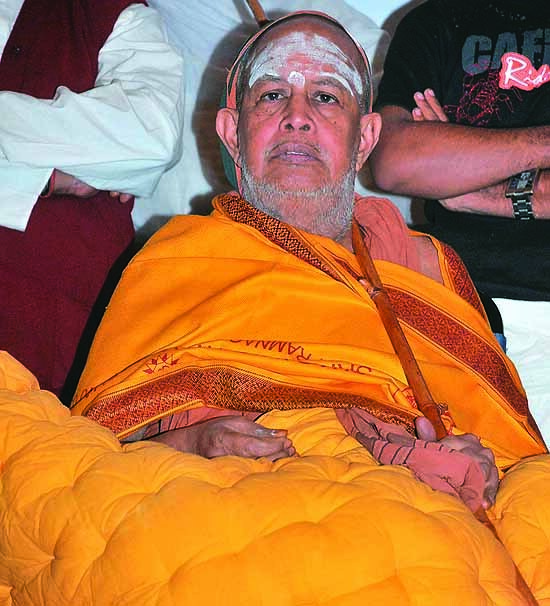 Swami Jayendra saraswati, the 69th Pontiff of the Kanchi Kamakoti math, died peacefully this Tuesday at a hospital at a good age of 83. His tenure as head of one of the most popular and revered spiritual hubs, consecrated by Shankara himself, was strange in many ways. To understand his position and place, one needs to trace the origins of Shankara’s maths across the country, and what they stood for. The date of Adi Shankara has always been under dispute and debate. Scholars are equally divided between 8th Century AD and 4th century BC. Yes, the chasm is too wide, but that is the nature of any historic truth, especially when it is about a man who strode like a colossus amidst the ruins of hinduism and its mystical tradition. In his brief life of 32 years, historical documents testify to his miraculous spiritual transformation as a kid; his journey in search of his master; his eventual redemption at the feet of Gaudapada, and then the tremendous outpouring of commentaries, ecstatic poems, fiery lectures tours that took him to the length and breadth of Indian sub continent reinstating the ancient faith contained in upanishads - the most esoteric and cryptic spiritual texts found anywhere in the world. At a time, when Europe was entering its dark ages, and lost in spiritual poverty and meaningless, India was awakening to old truths cast and refined by Shankara for new age and culture. His appeal was to universality, and the dignity of man at his deepest level. To him, the peripheral differences of the body, color, caste, and professions were secondary, and his message touched the deepest chord in Man, as an organism destined to realize within himself the purpose and destiny of the cosmos he inhabits, and in which, he now feels insignificant, burdened and choked. His message is one liberation, not from the world, but of it. To revitalize a continent as big as India is no simple task for a single man, and Shankara was pragmatic enough to realize he needed to establish centers of contemplation, headed by men who understood and realized his deep message and keep the wave of spiritual emancipation rolling. In four corners of Indian peninsula, he created conclaves of learning - Jyothirmath in North, Sringeri in the south, Puri in the East and Dwaraka in the West. The mandate to his apostles was clear. They were stay put wherever they were, and channelize energies and aspirations of people living there towards a loftier goal of spiritual ascendancy, and revitalize a flailing brahmanic culture. The men he appointed were men of great stature and spiritual maturity. Mostly, the first generation of leaders were from the original group of his disciples , who had traveled with him across the country and learnt sitting at his feet. Like a good manager, Shankara knew whom to place where. By 32, Shankara was done with his work - Centers were running well, his commentaries had become sacred texts themselves, people were flocking and revival of hinduism was happening with renewed vigor for all to see. It is extraordinary for us at this distance, to even contemplate the singular achievement of Shankara, breadth of his travel and the depth of his intellectual outpourings during an age when travel was difficult and communication sparse. But that was Shankara - a spiritual giant among men. What is interesting in the above discussion is there is no concrete evidence Shankara ever established Kanchi Kamakoti math in Kanchipooram. It is certain he visited the area; prayed and mediated in temples and courtyards there, but did he actually create a center there is questionable? Though, over the years, decades and perhaps for few centuries now, scholars have dug out evidence to claim Shankara definitely wanted an additional center in the south to venerate Saraswati, Goddess of learning, and that he had great affinity to Mookambikai, in whose name he wrote beautiful poetry, does not really prove conclusively he personally established kanchi math, as surely as he did the other Maths across India. All this is, of course, highly debatable and evidence can be presented both sides. Whatever the claim may be, the indisputable fact is that the Kanchi math has remained one of the more famous and respected centers, despite doubts about it origins or authenticity. What then made the center at Kanchi so popular? Kanchi math has by stroke of fortune or grace ( whatever is appropriate) had some extraordinary saints at its helm. In the last three centuries, one after another, very saintly and inward looking Men have been nominated and held the role of a Guru at kanchi. It is not so much the place that attracted people from all walks of life, but the guru who held fort there. ironically, the charisma, erudition and inward spiritual resonance of Kanchi Gurus far eclipsed those from formally acclaimed maths in other parts of India. For a long time, Kanchi held its place in people’s hearts because of the person who resided there; not for anything else. The spiritual eminence of Kanchi math reached its apogee during the tenure of Sri Chandrasekhara saraswati, the guru of the Jayendra saraswati ( subject of this essay). From 1894 to 1994, exactly hundred years, Chandrasekhar saraswati lived and breathed the philosophy he preached, spoke and wrote. A man of few words, who preferred silence to eloquence, who lived by the strictest tenets of brahmanic faith, exuded a spiritual fragrance that attracted seekers from all over the globe. There was something in his frail squatting figure, wrinkled face and austere demeanor that made questions unnecessary. Like Ramana, he taught and spoke in silence. Continuing the ancient practice of nominating successors , Sri Chandrasekhara saraswati handpicked Jayendra to succeed him for what he saw in the young man as characteristics of a saint. But what followed thereafter was something different. Jayendra was unlike his guru in all respects. While Chandrasekhara saraswati was inward looking, Jayendra was extroverted; while one shunned fame and glory, the other seems to court it with pleasure; while one stayed behind closed doors and shared spiritual comfort by a mere glance; Jayendra found solace in cutting ribbons and establishing public institutions for material welfare, education and growth; while one wrote and spoke with clarity, jayendra had trouble articulating basic spiritual tenets. In all ways, there couldn’t have been two more diametrically opposite seers. Its not to say the Jayendra was wrong choice; but it definitely wasn’t something Kanchi math was used to. in 1987, in an act of rebel, defiance or time-out for meditation, Jayendra disappeared from the math leaving behind symbols of stewardship of the math. It was an act of sacrilege in conventional terms, but Chandrasekhar saraswati saw beyond the veil of conventions and brushed the event aside as a necessary step in Jayendra’s spiritual evolution. In his brief absence, however, he consecrated the young Vijayendra as his next successor, thereby breaking centuries long tradition of having two seers operating at the same time. 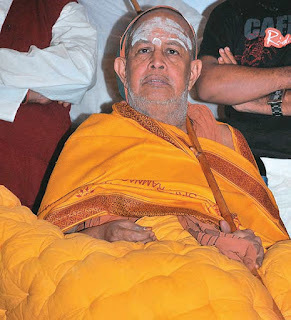 After Chandrasekhara saraswati passed away, Jayendra continued to move his base away from the spiritual center of math. He believed his role was social, and from the esoteric heights of vedanta, he plunged into social upliftment. He began to associate himself and his followers with politicians, industrialists and others who could financially support his ventures, all of which were, no doubt, initiated with good intentions. But when base metal touches gold, purity is corrupted, and very soon the Math, and Jayendra himself was caught in political and monetary controversies, including murder of a former employee. For a brief period he courted arrested as well. In due course things settled down, and Jayendra himself reconciled to a mellowed role within the math. Over the last 15 years, he had led more or less a quiet life, interspersed with bouts of illness. His death last week, marks an end of a turbulent era in an institution known for its stability and constancy. Spiritual institutions of any kind have a precarious existence. When spirituality as such becomes organized and subject to whim and fancies of its “leader” - its nominated head, there is always the distinct possibility it will lose its meaning, relevance and context. This is vindicated throughout history, right to the present day. It is hard, however, not to form institutions. However much a saint shies away from creating one, it follows. When J krishnamurti dissolved the order of the star in 1929 , one of the richest and influential spiritual organizations, he believed the truth is a pathless land, and no one can lay claim to it. But very soon, mere twenty years later, Krishnamurti foundation (KFI) was established, which claimed it wasn’t a propaganda machinery. But it quickly became one. The purity of innermost spiritual experience cannot be captured within the walls of any sect or institution. At most, it can help regulate good, decent social adaptation and behavior; nothing more. If one needs to glimpse and learn the beauty of advaita, the depth of ancient Hindu wisdom, it can done through the genius of Adi shankara scattered in his innumerable texts, and need not be sought in institutions, unless the place is fortunate to give seat to someone of the caliber of Sri Chandrasekhara saraswati of Kanchi, or Abhinava teerta of Sringeri - whose very presence lent a radiance to the walls within they lived and taught. Yet in all fairness, in his own way Sri jayendra saraswati forged a path for himself. He broke conventions, which is always a difficult thing to do. In the process, did he do irrecoverable damage to the sanctity of Kanchi math, or did he leave it a better place than before - none can tell. But his was life full of action and vigor. His beaming smile and fast life belied every expectation of an established Guru. If only he had the eloquence of a Chinmayananda, things would have probably been different. He could have explained his reasons better. In the absence of such talent, today and forevermore, we will remember him as a sage who lived in the garb of a social activist. That is definitely not an improper place in ones heart.